I AM SIMPLY PASSIONATE ABOUT FESTIVALS; THEY ARE ONE OF THE FEW PLATFORMS THAT ALLOW AND ENABLE FREEDOM FOR EXPRESSION IN ALL SHAPES AND FORMS, CATERING TO ALL DEMOGRAPHICS. THEY OFFER EXPERIENCES FILLED WITH MESMERISING MOMENTS OF AWE, SURPRISE, CELEBRATION, PERSONAL EMOTIONS AND INSPIRATION—DARE I SAY, THEY ARE EVEN LIFE-CHANGING FOR SOME. “Is there room for one more? I am proud to have founded The Dreaming (1995-2009), a festival which catered to so many artists, participants, community and audiences on an international and national scale. A festival is a time for all to gather and reflect; since time immemorial we have gathered on country to call, sing and dance. Over the years there has been much research regarding the necessity and sustainability of such cultural events and now it is evident that critical mass celebrations have widespread outcomes and long-term benefits and implications. There are many Aboriginal and Torres Strait Islander festivals that have been ongoing across country and we all know they are a healing tool, empowering our people to continue the ancient and the new, providing and encouraging discussion of those daily issues faced by many of our communities. My experience on a personal level working with festivals across urban, rural and remote communities has been witnessing the profound effect they have on audiences. The well-being of our people through the arts sector for me is paramount so I was saddened to hear of The Dreaming festival’s demise. With global economic challenges across the sector we have to get more creative in our planning, structure and relationships when it comes to funding expensive undertakings such as festivals. Perhaps the ancestors were indicating a time for change? Change allows us to reflect and consider new models and approaches to the structure of budgets and resources for varying festival models. We need to evaluate the relationship with land, consider the place of mining sponsorship along with the Commonwealth’s obligation to the festival sector, including its commitment and responsibility to support the maintenance of the oldest living and adapting culture on the planet. The corporate sector has developed partnerships with many arts companies, and should recognise that festivals represent a unique opportunity to foster community ownership, inclusion and basic relationships across differnt industries. Is there room for yet another boutique festival with a niche market that not only provides entertainment but enables the wellbeing of my countrymen and women? I strongly believe there is. And I am working towards a renamed and rebranded event, the Boomerang Festival, which aims to continue the spirit of The Dreaming festival. The event will be held at Byron Bay on the lands of the Bundjalung in October 2013, signalling a return to country for me in my role as volunteer artistic director. It’s been a hard slog, and sometimes I question how far we have come and whether different cultural voices are still viewed with suspicion. But we are fully committed to the festival and, beyond securing council approval, the challenge will be to garner further financial support that will allow us to re-establish an annual gathering that is sustainable and profitable. Some 17 years ago, when I began developing my very first festival, I realised immediately that a successful festival only occurs when the team runs a like a precision engine. I needed to understand every facet and mechanism of the vehicle. The driver for that first festival was Karilyn Brown [the then Executive Director, Audience and Market Development, Australia Council for the Arts], and thank God for her. I am indebted to her persistence, guidance and nurturing. Success was her only option; there was simply no room in the dialogue for failure. The road ahead was a complex one with many twists and turns and I was behind the wheel with my ‘P plates’ on. I recognised the enormous scale this opportunity presented: a rare chance to showcase our culture from a very different perspective. There was the responsibility and cultural obligation of ensuring the content was appropriate. There was the challenge of showcasing a diversity of country, language and the many artforms we practice—from ancient chants, the mesmerising balletic fusions of our dances, the ritual drone and the rhythm of our youth. So I began my daily mantra of ensuring cultural authenticity and control. I paid attention to detail and process, I discussed industry standards and felt overwhelmed and completely out of my depth. My teachers and cultural guides were many; the voices of Oodgeroo Noonuccal, Justine Saunders, Vivien Walker and Brian Syron guided me through the rips. Their words and advice echoed daily on the wind, and I listened and watched. I was astounded as I saw the tide change as more and more cultural practices were given space for maintenance, rekindling and revitalising. I embarked on travelling the breadth of country, seeking cultural knowledge from the Sweetwater of the Clarence River home of the Bundjalung to the escarpment lands west of the Kimberley, witnessing Bunggul on the Dhalinbuy homelands of the Yolngu and sitting on the red earth and hearing the Inma of the Seven Sisters, and then crossing the gulf country to the saltwaters of the Lardil. It was the beginning of a rich cultural education I had never dreamed possible. I am indebted to the many senior cultural custodians and lore men and women who were my mentors on so many levels. When we launched my appointment as the Artistic Director, The Dreaming festival, back in 1995, there were rumblings of discontent from some members of the community; loud questions erupted regarding the name of the festival and the essence of the program. Some even suggested that this was exploitation of the oldest living race. It was a minefield and an educative process all rolled into one. 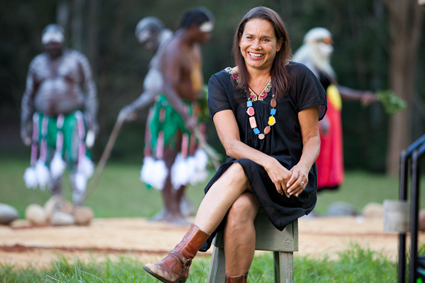 I took the criticism personally, but I was buoyed by the support of my dearest colleague Lydia Miller [producer, performer, administrator and currently Executive Director Aboriginal and Torres Strait Islander Arts, Australia Council]. Had she not been there I would simply have given up. The day of the launch was a warm one and I sweated in my suit as the media gathered at Djubagalle, under the sails of the Opera House. I silently paid my respects to her original inhabitant, Bennelong, wiped away the tears and prepared to face a very short career in the world of festivals. Then the black men arrived; resplendent in their attire and with smiles gleaming they embraced me. Uncle Chicka Dixon and Gary Foley stood shoulder to shoulder with me as we faced the onslaught. “You’re a good community girl from a strong mob,” Uncle remarked. Those few words changed my world; with them he passed the mantle to me. The strength and power of that gesture gave me the courage to think big and create annual events that ensured intergenerational exchange and knowledge transmission.